Heat oven to 425°F. In 1-quart saucepan, mix pomegranate juice, brown sugar, 3 tablespoons of the vinegar and the rosemary sprig. Heat to simmering; reduce heat to medium-low. Cook until reduced to 3/4 cup. Remove from heat; discard rosemary sprig. Stir in remaining 1 tablespoon vinegar; set glaze aside. Rub all sides of chicken with chopped rosemary, salt and pepper. In 12-inch skillet, heat oil over medium-high heat. Add 4 chicken breasts, skin side down; cook 5 to 6 minutes, turning once, until golden brown. Remove chicken from skillet to shallow roasting pan. Repeat with remaining chicken. Place chicken skin side up in pan; baste with 1/2 cup of the glaze. Bake uncovered 35 minutes or until juice of chicken is clear when thickest part is cut to bone (at least 165°F), basting once with 1/4 cup glaze. Drizzle chicken with remaining glaze. 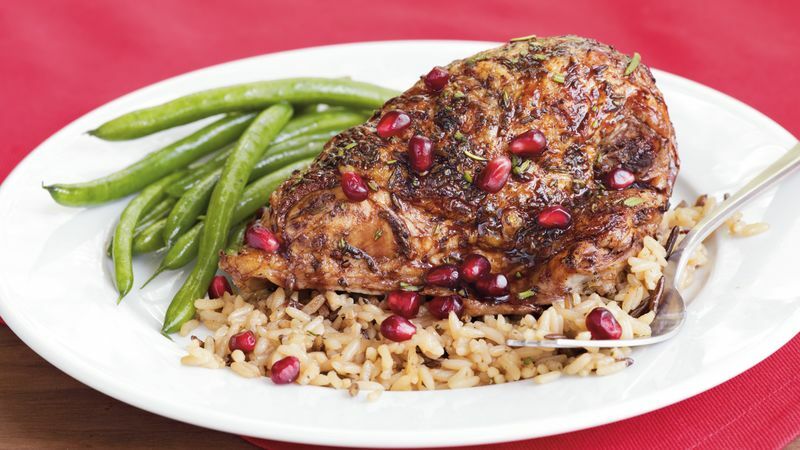 Sprinkle with pomegranate seeds and parsley.